Today I took the day off of work and went our for lunch with Carly. I’m finally wearing a piece from our ‘Secret Garden’ A/W 13 collection which has just launched and is available from our website. photos of me prancing down the street in my c&p. amaaazing outfit!! Those shoes are awesome. You look gorgeous! Ahh I love casper & pearl. <3 And what!? They're getting rid of GFC!? So bautiful! love the colors! Stunning! I really want a pair of jelly sandals and the 'Lennox' dress too, of course. I am absolutely in love with the sweater layered over that dress! Super chic outfit. And I adore the jelly flats! love this look, especially the red knit. stunning. I love everything. Fu**ing jelly shoes. Awesome. Thanks for dropping by my blog. I really like your store, I checked out your web site. The photoshoots are very creative :) I'm fond of your Dahlia dresses! By the way I followed you via Bloglovin' and liked your page on Facebook. I'm so glad I discovered your blog! You are so unique and amazing! Love how you combined clothes and accessories! And thank you for your kind comment on my blog! oh my for sure, i'm going have a real good look! Those pictures are beyond stunning! 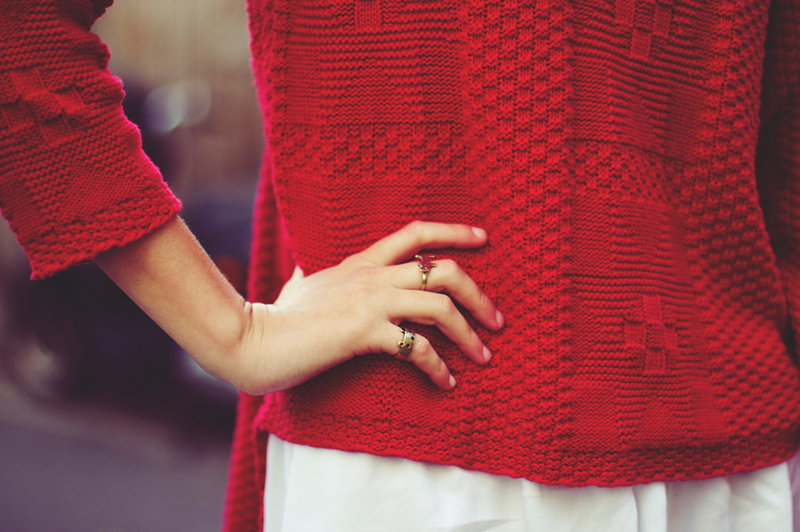 Love this amazing red sweater! stunning outfit and pics !!! Such a wonderful outfit! I'm in love with the jumper and I had an exact pair of jellies like that when I was younger! It's neo-grunge. You look straight off the SL runway. Thanks for posting the photos and feel free to drop by me too when you have time. Perfect look. I love love the red sweater. like this is the coolest thing ever!!! the photos are beautiful and the clothes are too! And btw, thanks for visiting my blog! great to have you guys reading my post! You look amazing. Red is so beautiful on you! Seriously adore C&P! great outfit, im in love with the jelly shoes. Woow! This outfit is so fabulous! Love red lips! I'm so happy and proud that I've found your blog and now I'm following you! You are doing really good stuff! :) I love it! I absolutely love how you styled the dress! The red jumper just works perfect with the white dress! thanks for your comment, I'd love to wear casper&pearl one day! wow very lovely pieces you made!! Such a cute look, I love your sandals! Pretty girl. The photo are full of feeling,romantic. I like too the post that you has published :) I'm in love with the style you have with this outfit, your shoes with that skirt is so amazing!! I am in lov with the red sweater!!! Love the whole look dear! So Cool! Those jellie's bring me back to my childhood! What a playful and fun outfit. thanks a lot, i really like the brand and i would love to wear it ! do you have stores in germany ? You look so nice, and i love your jelly shoes, where did you buy the jelly sandals? I love a knit over a shirt dress, so simple but looks great! This is so gorgeous, I love how the red sweater is layered over the dress, so effortless! Love thi pics ! Whats is your camera ? Hey!! Thank you for your lovely comment!! In love with this outfit, gimme gimme. thanks for your comments girls! you can purchase the knit from www.casperandpearl.com - only 2 left! I'm absolutely in love with this styling ! and the Juju jelly sandals!! the whole look is a total love! Cute look. The color on the jumper is great. Just discovering this blog, and yes, I really like it ! Everything about this outfit just pops! A+++ stylingng. Making me realise how much i need some bright cropped sweaters in my life.